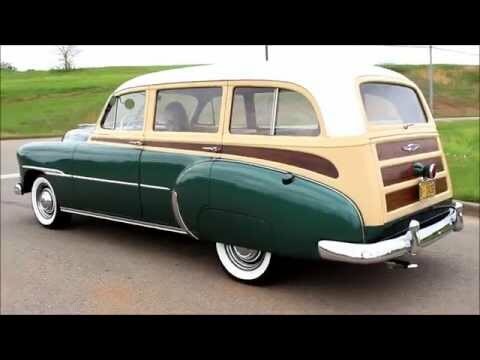 For sale we have a 1951 Chevy Tin Woody Wagon. This is a fresh build with pics of the build. The body is laser straight with great fit of all the panels. All the stainless looks great as does the glass. When you look at the chrome you can see the bumpers look new as well as the door handles. The body is covered in the Fathom Green paint that is accented by the White Top and of course the simulated wood on the sides. Staying with the style of the day it's fitted with Wide-White Tires and Painted Rims with rings and caps. On the inside it's done in tan and brown. The seats are covered in tan vinyl with the carpet being brown. The dash looks all correct and is painted the body color. The doors has the wooden panels and trim as well as the rear side panels. The headliner is brown cloth with the wood bows and trim. Under the hood it's all stock with the 235 L6 Engine. It has the Three Speed Trans. Also, it has the stock drum brakes and steering. The engine bay is painted correct as far as we can tell. When you look under this Tin Woody it's clean and neat with good floors. The frame is done stock is also in great shape. If we can help you in any way with questions or a specific picture, you can call our office at (865)988-8088. Or feel free to call Daniel at (423) 807 0600, Devvin at (865) 256 2366, or you can e-mail us at smokymountaintraders@yahoo.com.